Writer and director Neill Blomkamp burst onto the scene four year’s ago with District 9, one of the most distinguished feature debuts of recent memory. That film saw him deliver a morally complex, emotionally perverting, technically superb film that surpassed expectations to the tune of $210M worldwide. His next film Elysium – set in the year 2154 where the wealthy have abandoned a shattered Earth in favour of a man made space station free of diseases, pain and suffering – sees him up the ante, yet retain that winning blend of action and social commentary. Factory worker Max (Matt Damon) finds himself in a state of desperation after being exposed to dangerous levels of radiation that leave him with a mere five days to live. With his only chance of survival enclosed within orbiting space station Elysium, Max reluctantly takes on a life-or-death mission that could put an end to Earth’s strife. His efforts are hampered, however, by Elysium’s Secretary of Defence Delacourt (Jodie Foster) and ruthless enforcer Agent Kruger (Sharlto Copey), who will stop at nothing to stop Max in his tracks. Blomkamp constructs a rich, technically spot-on film that, much like District 9 before it, leans more heavily on the subtext and potent themes that underly the entire film – the divide between the rich and poor and the need to control, in particular – than the narrative itself. In fact, the narrative is fairly rote and becomes muddled as it enters the final act when characters’ roles are reversed at the drop of a hat and the action – as stunning and well executed as it is, particularly the scenes that are set within the savaged slums of LA – takes over from the films more interesting elements. That’s not to say that it becomes tedious or bland, or that Blomkamp sells out, because neither are the case. It’s more that it would have been more interesting for him to spend more time detailing the specifics and less time focused on uninteresting and unnecessary sub-plots that bear little or no relevance to the main narrative. The romantic sub-plot between Max and his childhood sweetheart Frey (Alice Braga), in particular, is redundant besides providing Max with another reason – Frey’s dying daughter – to complete his mission. 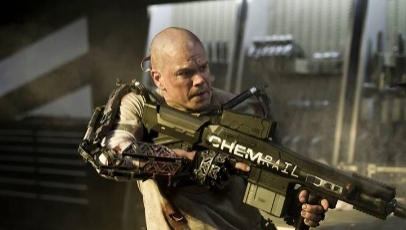 In spite of this, Elysium remains an engaging, thought-provoking and thrilling slice of contemporary science fiction, even if the middle section sags enough to allow time to notice that Foster’s lines have been dubbed over (never a good thing). It’s not so much distracting as bewildering and spoiling of her otherwise solid performance as the determined, barbarous and ulterior motived Delacourt. Damon is on blistering form as Max, Earth’s unlikely potential saviour, and Copey has a superb energy that translates well on screen. While it’s an undoubtable disappointment that the contrasts between the rich and the poor have been muted and that the films tone shifts too dramatically from social commentary to profound social commentary and character study to a somewhat predictable race agains the time scenario come the final act, there’s no denying that Blomkamp is a master visionary. And, with the aid of cinematographer Trent Opaloch, he’s created a film that works just fine as a full-scale action thriller, but could have been much better had it stuck to its exceptional guns promised in the first act. I was a little more positive on this film than you. I liked the idea of downloading the contents of one’s brain and the idea of a medical pod that heals all illnesses. I did, however, think that the end was a kind of cheat. I mean, how could a simple program make the world free? You just override it with another program. Still, I enjoyed that world. It was delicious. I saw the trailer on the Web and it looked angst-y and Robocop-y and then a shoot-em-up. But I got the idea he was rescuing his child or something. Sort of, though it does have other, more interesting elements to it. The blogosphere seems to have found a consensus on Blomkamp as a filmmaker: He can create a world but he can’t quite tell a story. You point out another huge weakness, though: He doesn’t commit. District 9 couldn’t decide if it wanted to be a mockumentary or a sci fi thrill-ride (though it ended up doing a fine job at both). Elysium was far less graceful in wearing its flaws. Mostly because its central characters were indecisive, which made for some pretty flat drama. Here’s to hoping he brings in a different writer next time. Great review. I watched this last weekend and then again last night. I liked it a lot. No movie is perfect but I thought this was not far from being a great movie. It reminded me so much of Blade Runner. I think him not committing to one of sci-fi or social commentary is what makes him unique as a film maker. I wouldn’t change writers but perhaps the storytelling needs the tiniest bit of a brush-up. I would have liked, for example, to know what drives Max so hard. We all have a survival instict but when we go to extremes it’s usually because there is something driving us. He doesn’t have a family and he rejects his childhood sweetheart when she asks for help. So what compels him to keep going forward against every odd stacked against him? What enables him to endure the pain of it all? I thought the other characters were great though. And Kruger was simply amazing in his lunacy.